I’m doing it again! I’m drawing things I’m not supposed to be doing! Very important people call me up to have me work on their very important things and they say “Jhonen, we need this thing FAST and only YOU can do it for us because you’re sooOOooOoo cool!? I graciously agree to do the work for them, and then I always start doing exactly what I shouldn’t, like drawing that guy up there thinking of some kind of…nuclear nub thing, when really what I should be doing is saving the world or whatever it is I’ve been hired to do by whatever secret agency. Ah well, it only took a few minutes and I’m sure the world is juuuuust fine. 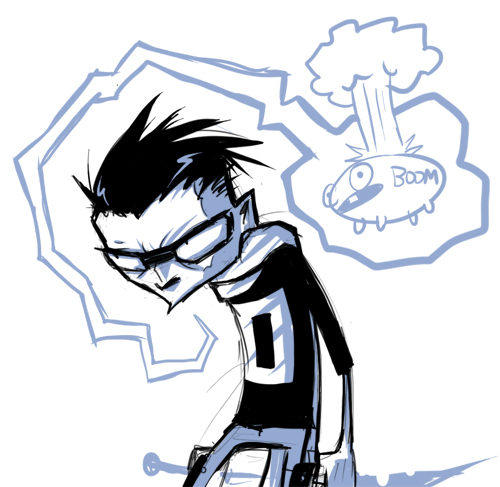 This entry was posted in animation, comics, nonsense and tagged JTHM, nuclear nub on March 21, 2012 by Jhnen VEE.